Do you have some extra potatoes lying around the kitchen? Or is there an unopened bottle of heavy cream in your refrigerator which you bought only because it was on “special” but is now reaching its expiry date? Well, fear no more… all you need is potatoes and cream for this recipe (I assume you have the other basic ingredients such as garlic, herbs, butter, etc..). Firstly, preheat your oven to 175 degrees Celsius. In a large bowl, pour the heavy cream and add 1 teaspoon of salt and 1/2 teaspoon of pepper. Prepare the potatoes by washing and peeling them. Place a Japanese Mandolin Slicer above the large bowl of cream and start slicing the potatoes lengthwise into very thin (about 1/16 inch) slices. Potato slices will drop into the cream (make sure they are entirely coated in the cream). If you do not have a mandolin slicer, slice the potatoes very thinly and drop them immediately into the cream to avoid oxidation. Using a rectangular pan (cookbook recommends a 10 x 6.5 x 3 inch pan), brush the insides with half of the softened butter. Line the pan with baking paper but leave about a 5 to 6 inch overhang on both of the long sides as they will be used to cover the top. Brush the baking paper with the rest of the softened butter and sprinkle some salt and pepper. Now, we move onto the layering part of the recipe. Trim the potato slices so that it forms an even layer over the base of the pan. Drop a few tiny cubes of butter and sprinkle some salt and pepper over the base layer. 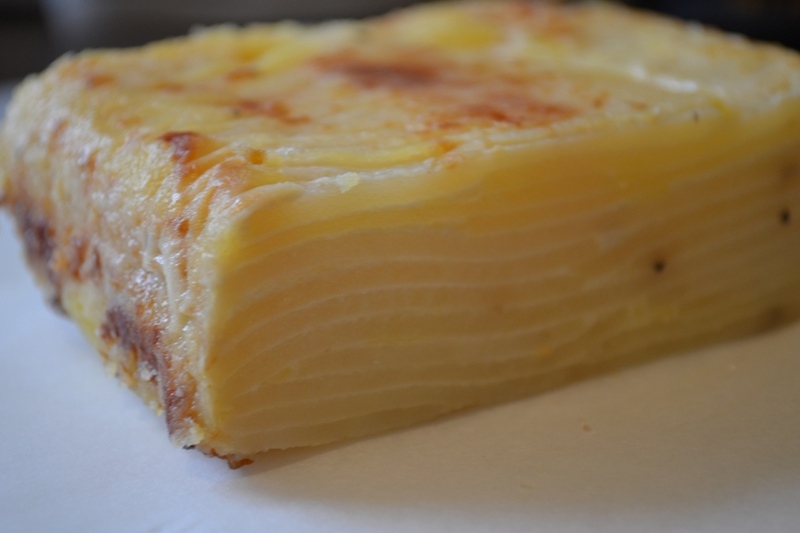 Continue with the next layer by laying more potato slices in a direction that would best fill the pan. Continue layering the potatoes. Add butter, salt and pepper after each two layers. Once you have done layering, fold over the sides of the baking paper to cover the top. Cover the pan tightly with aluminium foil. Place the pan into the oven and bake for 1 hour and 45 minutes or until tender when pierced with a skewer. Remove the pan from the oven and allow to cool for about 15 minutes. Cut a piece of thick cardboard slightly smaller than the size of the pan (smaller by just a few millimeters so that it freely covers the top of the layer without resting on the sides of the pan). Wrap the cardboard in aluminium foil (for hygienic purposes) and place it on top of the pave. Place some heavy jars/cans or other weights on top of the cardboard to apply pressure. Make sure the weights are evenly distributed. Once cooled to room temperature, place it in the refrigerator for at least 6 hours or a maximum of 2 days. When ready to serve, run a palette knife around the pan to release the pave. Unwrap the top of the baking paper to lift the pave from the pan (using the overhangs as handles). Trim the sides of the pave. You can then cut it however you like (we cut them into smaller squares which is different from the cookbook). Wait for the pave to reach room temperature before frying. 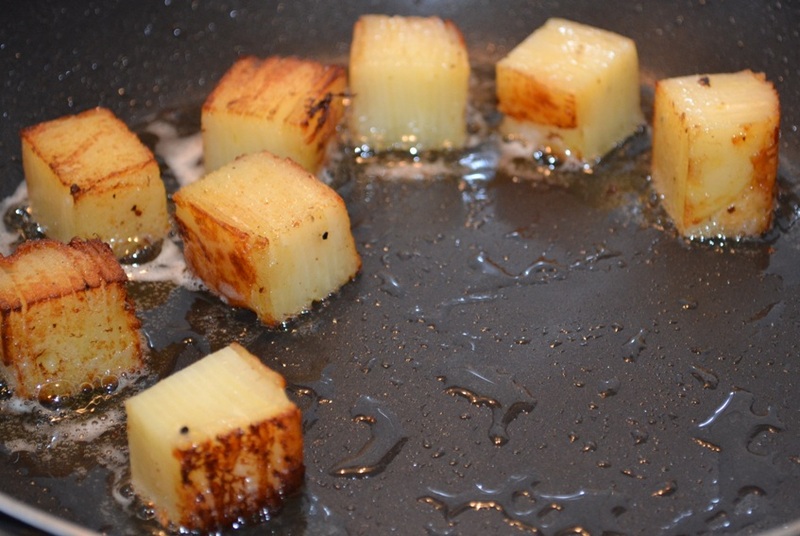 Heat canola oil in a frying pan (medium-high heat) and fry potatoes (both sides till golden brown) with thyme and garlic. Cookbook recommends a sprinkle of minced chives and a dot of butter on the top to serve. 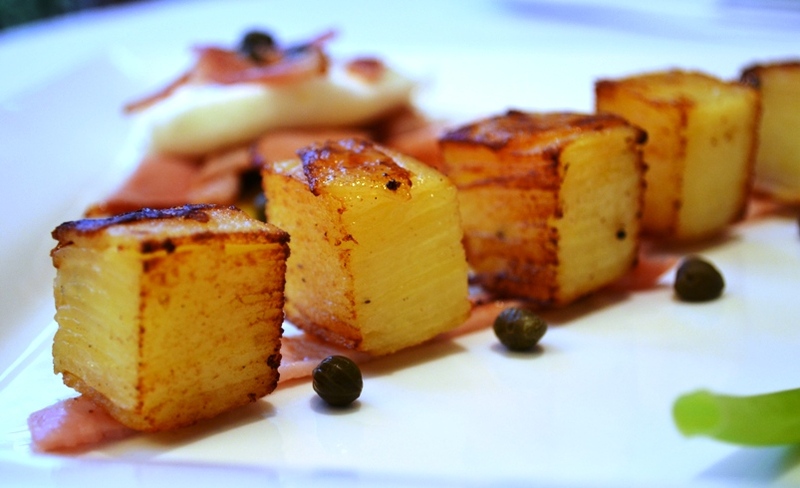 You can serve the potato pave with anything you like. 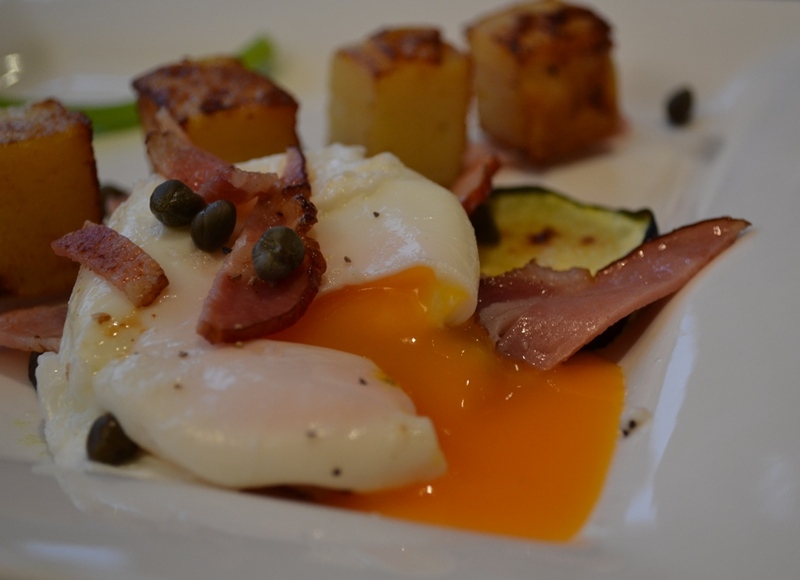 We served it with bacon, egg, capers and grilled zucchini. Those potatoes look really good. Hey, is there a way to subscribe to comments on your blog? I can’t see it. HmMmm… I don’t know about the RSS… thanks 😉 I’ll try and look it up! Oh yum- this looks so good- very detailed! Yummy! You can do something similar to this with apples. Use butter and brown sugar, but don’t really need much liquid as they don’t contain starch like the potatoes.